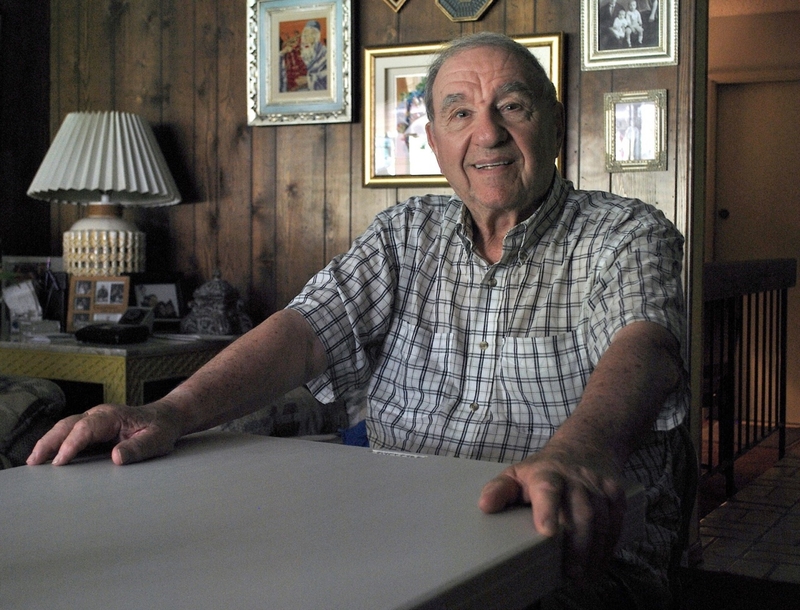 He is 94-years-old and lives alone in a stucco home in the West SFV he bought for $53,000 in 1974. His wife died three years ago and he tells me he thinks of her as gone on a long vacation. He can get up from the couch without a cane or walker. He drives a car. He goes to his granddaughter’s ball games. He shops, he laughs, he has no outward disabilities. And he came home 70 years ago, from Mindanao and the Battle of Midway, settled on the South Side of Chicago with his wife Frances, and they both had four children, three of whom died before they were three years old. He is my Uncle Paul Cohen, who is now in his 13th year (not consecutive) as Commander of the Jewish War Veterans of the San Fernando Valley. They meet once a month on Sundays and are now down to 175 members, from their high of 350 more than ten years ago. I sat with him in Woodland Hills last Saturday in those brown-carpeted, brown paneled rooms full of family photos and too many tchotkes. He had his plastic card table set up in the den, a place where he holds informal board meetings with the other veterans. His son and daughter-in-law live close by. They eat dinner at Chili’s with Paul almost every night. Their children also live nearby, and there are two grandchildren less than 10 minutes away. How has Paul lived so long? He ate meat often, loved grilled steaks. He wouldn’t know an organic vegetable from a conventional one, and his skin, remarkably free from wrinkles, is healthy but unguarded by sun-screen. When he was young, his Chicago was filled with unfiltered cigarettes, black chimneys, coal, stockyards, asbestos, lead paints, freight trains and steel mills. He lived through the most brutal battles of war, and came back to the grit and grime of the Windy City. When he was young he almost played professional baseball and was in a semi-pro league that travelled around in buses. His dream was to get on the field and get paid for it. Instead he became a lifelong skilled handyman who could plumb and electrify, saw and build. He drove a truck but he really dreamed of driving in home runs. His passion for baseball was passed down to his entire family. And to this day his weekends are spent going to watch his granddaughters play ball. Though he dropped out of high school to support his family, and never made it to college, he possesses that sagacious and practical wisdom mixing realism with optimism, and accepting human nature as it is. He had no gossip about the family, but still had an intense curiosity and memory about every person who we knew in common: cousins, friends, young and old. We spoke about why he never worked with my other Uncle, his brother-in-law, who owned a successful heating and air-conditioning contracting company in Chicago. “I’ll tell you what. I went to work for him one day. I had to disassemble and demolish a coal-fired boiler in the basement of an apartment building in Chicago. All the soot and the dust could only be removed through a small basement window. I shoveled all the coal and the dust up through the hole. Then I went up to my truck and loaded all of it into the vehicle. I was covered head to toe in black soot. I went to a lumberyard. I bought 2 x 4s and brought them back to the basement. I built up the wood and called a cement company to come out. They poured the cement into the form and we built a platform for a new boiler. I did the work of not only the demolition but the reconstruction. Then I got home at midnight. The next week, your Uncle’s partner Vito (?) said they had fired two guys in the company because I was doing their work. They were ready to give me a twenty-five cent an hour raise because I was doing the work of three men. Vito said he wanted to give me a two-dollar an hour increase but “your brother-in-law” said only twenty-five cents. That’s why I never worked for your Uncle,” he said. There was no bitterness in Paul. Recounting his tale of how he had, essentially, been screwed out of a good, solid living by his wife’s brother did not irk him. These are his versions of events. The people he names are long dead and the stories cannot be investigated or proven. But his recounting of something unfair was expressed magnanimously and justly, without rancor or anger. He was satisfied with his life. He told me he was going to turn on the air-conditioning and said to help myself to some cold water in the refrigerator out in the garage. I remarked that you never know your own strength until you are tested by some life event. “What choice do you have Andrew B.?” he asked.